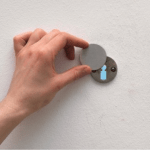 Considered by the worldwide-renowned curator Hans Ulrich Obrist as the “epitome of today’s artist”, Christodoulos Panayiotou’s generalized expertise seamlessly bridging many spheres of enquiry and modes of practice. He belongs to an emerging generation that, in different ways, is redefining the present though polyphonic oeuvres which weave a complex overproduction of material that tends to make strong demands on its audience. Panayiotou’s practice has moved from its origins in anthropology to flourish as an archival engagement that continually breaks the stigmata of the globalized popular culture. There are no ends and no beginnings in Panayiotou’s practice, only proliferation –new stones unturned and new paths to explore. 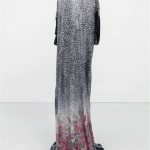 Adrastus Collection is proud to present this second piece from the artist: Untitled (2012). An earlier commission by CAC, Brétigny, the hot pink colored glass window comes after the pink color that was initially introduced “to symbolize love and sexuality” in the original rainbow flag created by Gilbert Baker in 1978 for the LGBT movement. Unexpected interest ensued, leading to a subsequent shortage of pink fabric in the US market. In turn, the design was reworked (resulting in a “commercial version”), and a year later it was further reduced for symmetry to six colours. This became the standard version of the flag. 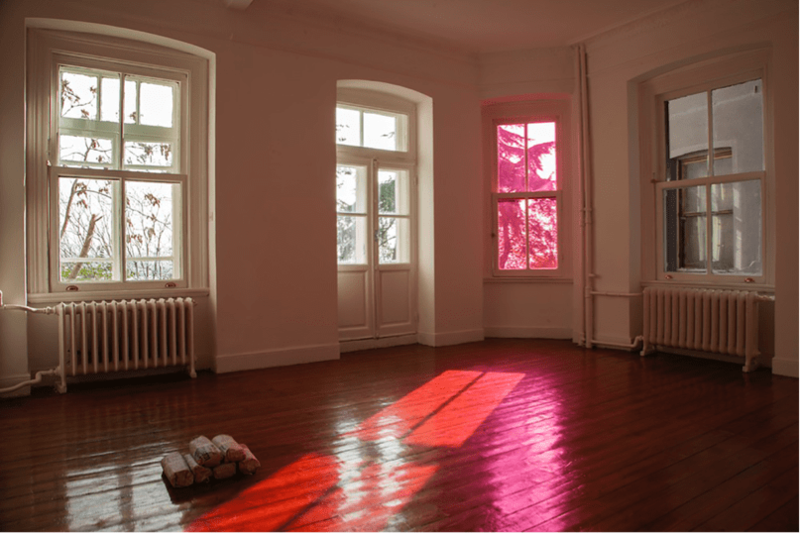 In Untitled (2012), the pink color emerges as a solid color, littered through the spectrum of light, re-inserting itself temporarily into the space of the gallery. The color introduced through the stained glass window into the gallery references its symptomatic disappearance from the rainbow flag by which the LGBT community is commonly represented. 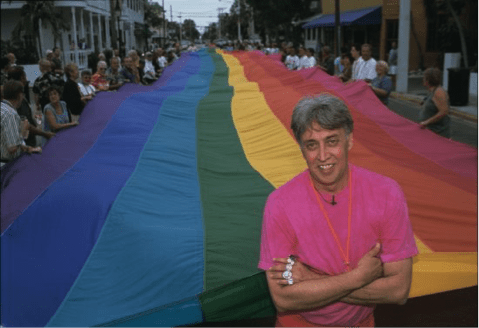 Gilbert Baker in 1978 with the original eight-colour flag which used to include pink. In this installation, Panayiotou’s art is a point of departure not only of the specific aspects of the history that surround the creation of the LGBT flag, but also of the true opening to the consciousness of what politics fail to understand. History and imaginery are re-enacted or recovered. In Untitled (2012), the color is used to commemorate, document or monumentalise the focus of his historical research and seeks to identify and examine the role of archetypes and tradition in modern society. Christodoulos Panayiotou was born in Limassol in 1978 and studied dance and performing arts in Lyon and London. He was awarded the 2005 DESTE Prize and has been artist in residence at institutions including Platform-Garanti Center for Contemporary Art Istanbul, Künstlerhaus Bethanien Berlin and IASPIS Stockholm. 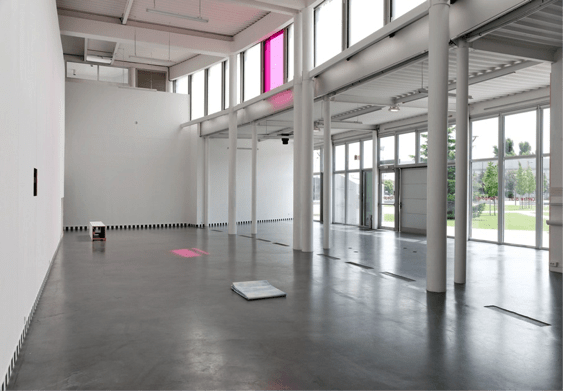 He has exhibited at The Museum of Modern Art Oxford, The National Museum of Contemporary Art Athens, Taipei Biennal (2008), Busan Biennale (2008), MoCA Miami, Rodeo Istanbul and Künsthalle Zurich.